Well, we're nearly finished with each other, so I wanted to drop you a note to say that although you are on your way out, you were - at least for me - pretty decent, and I appreciate that more than I can tell you. You see, the year before you was tough on me personally. And I made it through, and knew I would, but it's a lot nicer to say goodbye to a year that was much better overall. I hated my job even more than usual this year. But I had a job, and that made it possible to do things I loved, and to stay in our house, and to pay the bills on time. More good than bad. I had a few health things that would have been nice to avoid, but none were awful. Two colonoscopies in six months was pretty crappy (HA! ), but now I don't have to have another one for two years. Thanks for that. 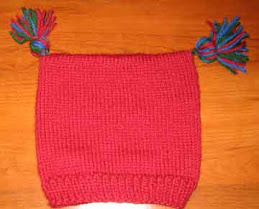 I didn't get as much knitting in as I would have liked to, and my beloved Rosie's Yarn Cellar closed. But I have plenty of yarn, plenty of ideas, and so many friendships I would not have if Rosie's was never a part of my life. And there are other fabulous yarn stores in Philadelphia, so, yep, I'm good. I didn't read all of the books I'd hoped to read, but I liked most that I did read, and I actually started borrowing more books from the library. Good for me, and good for the community, as public libraries are one of the most important American institutions. Terrible things happened to people, at the hands of terrorists, and also at the hands of those they knew and/or loved. No one in my immediate family died, or was injured in any major way by anyone else. That's a big plus. The Tim and all of the animals are still going strong, in spite of some pretty serious issues for some of them. That's the best news of all. The summer was miserable, and the winter has been too warm. But we never lost electricity during the worst of any weather, nor have we been destroyed by hurricanes, tornadoes, floods, or blizzards. Good in the overall picture of things. So many other things I could mention, but I'm sure you are getting the drift by now. I managed to become an inkling more of the person I want to be during your time, and a lot of it was because of things listed above. I have ended this year much better than I started it. I know there are others who can't wait for you to leave. As my mother would say, that's what makes horse racing. I'm glad you were here. You were, for the most part, kind to me, and I have no regrets (what's the point now, anyway, right?). Happy trails, 2015. Tomorrow when I wake up, it will be 2016, and it will be perfect with possibilities. I hope I'm still here to see what is coming. Well, we had a great day on Christmas. Quiet and relaxing. It was too warm and humid, but we tried to ignore that and enjoy the day anyway. Our house ended up looking nice, once we got everything ready, and then actually cleaned up! This year, the Misfit Toys had a little tree of their own. 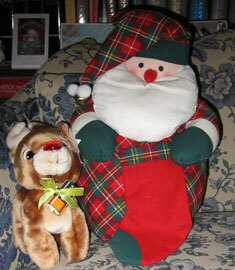 Santa and Rudolph were at the ready. 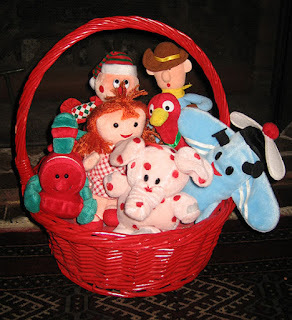 As were the Misfit Toys. One of the windows looking out onto the garden was especially dressed up! The Christmas tree was just waiting for Santa. The secretary was even fixed up! And there were tons of other decorations that you'll see one way or another. :-) If you are on Instagram, I have some pictures there as well. Anyway, Santa did in fact show up and it was quite exciting. One of Dug's favorite gifts was a corduroy candy cane. 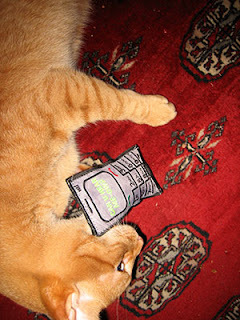 In typical kitty fashion, Jetsam played with Pip's gifts - a catnip stocking and a catnip wedge of pizza! 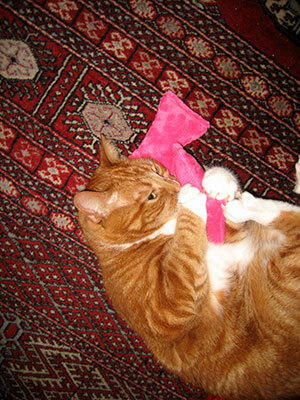 Milo the Koodle found the Little Pink Socks (like Mooch has in the "Mutts" comic strip) to be completely irresistible. Pip repaid Jetsam by playing with one of his toys, a catnip cell phone. 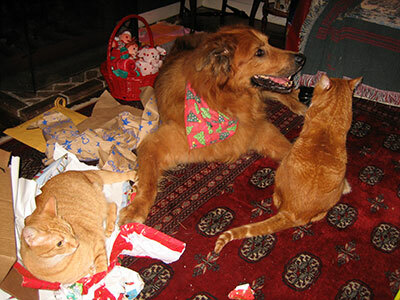 There were several pauses in the action, which meant that we actually spent a good part of the day opening presents and finding out what goodies were in our stockings. Later in the day, we had a great Christmas dinner, and watched the end of "National Lampoon's Christmas Vacation," which we had started watching a few days before. Many lovely, sweet, and funny gifts were opened, many carols were listened to and sung, a lot of food was eaten, and we had wine in the afternoon and eggnog in the evening. The only thing missing was cold weather and a fire in the fireplace. But we were all together, and it was a wonderful day. You can't really ask for more than that. This is a photo of my parents, though I can't say exactly when it was taken. But I can tell you that today would be their 74th wedding anniversary. When I was a little kid, I could never fathom why anyone would get married the day after Christmas - I mean, Christmas is big enough as it is, so why try to add something else really big onto it? 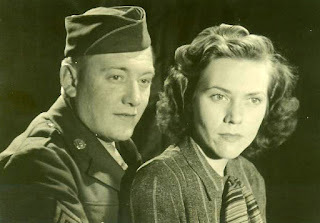 But as it turns out, their wedding date was December 26, 1941, because my father had been drafted into the Army after the attack on Pearl Harbor on December 7, 1941. They wanted to get married and move to wherever he was assigned together, but there was a hitch. At the time, it was not possible to have a wedding in the Catholic Church during Advent. The first available day for a wedding then was December 26. Now of course, people can get married during any liturgical season, so it wouldn't be an issue. But I can easily imagine the two of them working this out so that it would fit into things perfectly. My dad was a very organized type, and my mother was an extremely determined type. Both of them had good senses of humor, so I'm sure they appreciated any of the irony or ridiculousness of whatever happened as well. When my father died in 1969, they had been married just shy of 28 years. On their 25th wedding anniversary, they renewed their wedding vows and my dad made sure they threw a huge party (it was even catered - *that* was how fancy it was! ), and I'm pretty sure they invited everyone they'd ever met. It was quite the event, and I like to think that it was one of my mother's happiest memories after he died. So as you are still enjoying Christmastime, raise a glass in honor of two people whose lives were not perfect, and actually quite difficult, but who were the very center of a weird and happy family that still misses them every day. Happy Anniversary, Mom and Dad! Love you. For I bring you good news of great joy." Santa Pip says that he hopes all of you are having a wonderful Christmastime, and that the *real* Santa's visit to your house tomorrow night will mean a fun Christmas Day is in store for you and yours. What a lovely day! Weather that feels like it's Christmastime (finally! ), getting the last of the decorations placed around the house, the ornaments on the tree, and some cookie dough in the fridge, firming up to make some yummy cookies tomorrow. There are still things to do - clean the house, finish the laundry, wrap presents for The Tim, and some odds and ends - but the big stuff is finished. 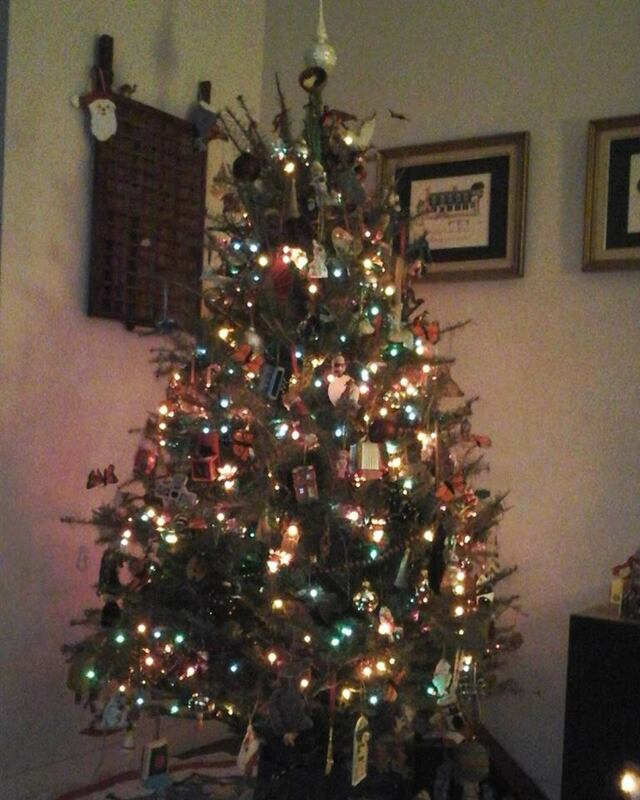 With a week left, and time to enjoy everything about Christmastime and Christmas Day. I'll take it. The only down side for today is that The Tim has to work this evening, so I'm on my own. Not that we are missing anything exciting, but I feel bad that he has to work so much during this time of year (six-day weeks instead of five-day weeks). He is the type of person though who makes the best of things, so though I'm sure he would rather have the day off, he doesn't get as bummed about it as I would. This evening I'll probably do some reading while listening to Christmas music. 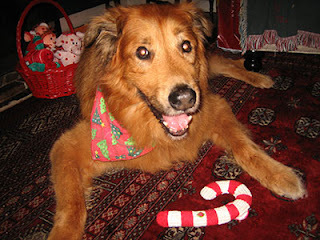 Dug and I will go for his evening walk, and I'll have a nice cup of tea and a Christmas cookie or two. I would like to stay up to see some of "Saturday Night Live" with Tina Fey, Amy Poehler, and Bruce Springsteen, but I sincerely doubt I'll be able to stay up that late! Days and evenings like this at Christmastime just make me happy. It always feels that it should be like this. So many people try to do too much, and get so aggravated, I sometimes wonder why they even bother. I hope you are enjoying your weekend, and that you're ready for it to be less than a week until Christmas Day! 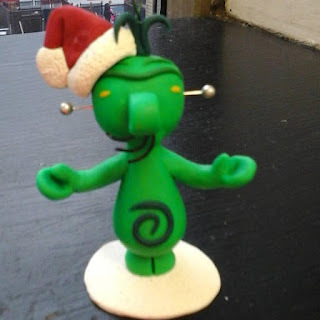 Let me introduce you to a lunar friend of mine who visits every year - meet Christmas Moon Man! A few jobs ago, one of my co-workers made this and gave it to me for Christmas. I was blown away, not just because it was so nice of him, but because he was a person who also loved Christmas, but never, ever participated in any of the work-related Christmas events. But that year, on the last day of work before our break, I walked in and found a little gift bag on my desk, with a package inside that said, "Here is your own Christmas Moon Man" - and this guy was inside! I think he is adorable. Originally I was going to pack him away with our decorations at home, but I decided that he was meant to stay with me at work, and give me extra reasons to smile during Christmastime. I always put him right on my desk, where I can see him during the day. Just this little thing can sometimes be what keeps me from feeling so awful on any given day. This is truly a case of something unexpected having a lovely and long-lasting impact on the recipient. The other day I posted this picture on Instagram and Facebook, and tagged the creator. 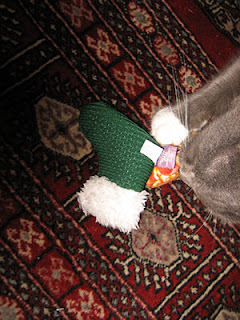 He was thrilled to know that I still had it and that it made me happy. I think it's a perfect story for anytime, but especially appropriate for this time of year, especially just one week away from Christmas Day! Have you ever received a completely unexpected gift? Was it something that you liked? Do tell! Hooray! We are TEN DAYS away from Christmas Day!! And for today's Ten on Tuesday, Carole wanted us to list 10 Gifts You Can Pick Up at Your Grocery Store. 1. Coffee and tea. Fortunately, there is enough variety that you could put together a nice package of either or both of these. 2. Cheeses. The market has a decent selection of cheeses, and some nice breads and crackers that you could buy to go with them. 3. Platters. There is a nice deli, so if you were so inclined, you could get a cheese and/or meat platter to take to someone. 5. Plants. They have some Christmas cactuses (cacti? ), and poinsettias. Not very elaborate, and you have to choose carefully, cut you could find something nice. 6. Candies. At Christmastime, they have a section where they sell all kinds of candy, from things like hard ribbon candy, to packages of Ghirardelli chocolates. You could pick and choose and come up with a pretty yummy gift. 7. Spices. For such a small store, the spice section is actually pretty extensive. If you know a cook or a baker, you could pick up a few things and package them nicely as a gift. 8. Eggnog. It's not packaged all that glamorously, but if you know an eggnog lover, they have a few different brands and sized containers. 9. Packaged cookies. 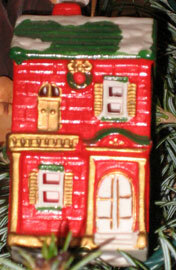 If you don't have time or the desire to bake your own, you can find some holiday-themed packaged cookies, such as Pepperidge Farm varieties. 10. Gift cards. Again, not a huge selection, but at a minimum, they have Visa and American Express ones, so if you know someone who would love a gift card, those two would allow them to use it pretty much anywhere. So, not necessarily a lot of exotic choices, but certainly items that you could give as a gift (most of them with a little work from you to make the presentation nice), without feeling that they scream "I got this at the market." And even if it does scream that, if you give it with a genuine feeling and a happy heart, it's not your problem to worry about how it's received, right? Hello all - I had a post in mind for today, but this morning on Facebook, Kim shared this video, and I knew that the joy of the season embodied in this video needed to be shared with all of you as well. There is SO much here. SOOOOO much! Christmas Day is 13 days away!! First of all, thanks to everyone for the well wishes earlier this week. My test was completed, and if nothing wonky turns up, I don't have to have another one for two years! That would be a lovely gift. Do you like Christmas movies? It will probably not surprise you to know that I LOVE them! 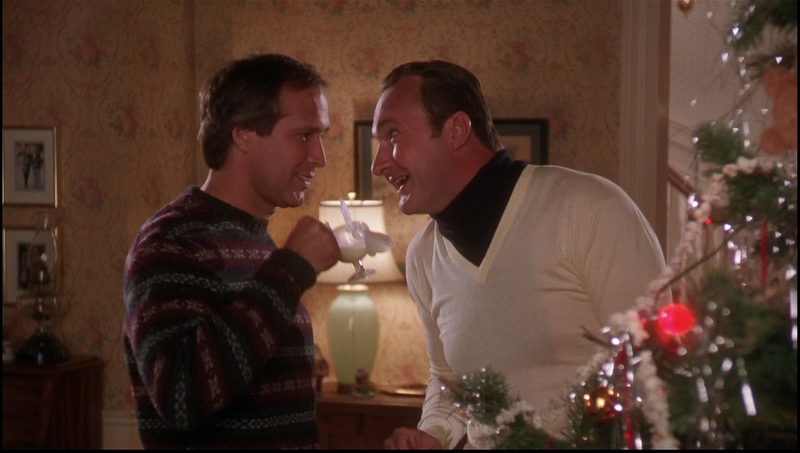 I have several favorites, different times, and different genres, but one that speaks to me very closely is "National Lampoon's Christmas Vacation." It is quite easily one of the most stupid movies ever made, which is part of the reason I enjoy it so much, but really it is mostly because it is so evocative of my family. Truly. I love my family, and we enjoy each other's company, but it's a pretty loony bunch. In a good way, but still ... the interesting thing is that we all managed to marry people who have no trouble fitting right in, albeit in their own special ways. I think every single niece and nephew of mine - and now some of the great-nieces and great-nephews - can recite all/part of the movie. We go around saying things to each other and responding in lines from the movie. We have cousins like Cousin Eddie, Cousin Catherine, and their family, who we would sometimes see only at Christmastime growing up. They may have lived in the same town as we did on occasion, but everyone always ended up at our house. One of everyone's favorite things though, is more recent. Years ago, The Tim decided that he needed to recreate Cousin Eddie's Christmas Eve look for Christmas Eve at my sister's house. Well, he found a white sweater and belt for $3.00 total at a local vintage shop, but had real trouble finding a black dickey. The best part for me was watching him go into stores and asking clerks if they sold dickeys. This was before online shopping was prevalent, so you pretty much had to find most things by going into different stores. This was also long after dickeys were a common piece of attire (if they ever really were). Finally, he found the perfect one at Woolworth's. I think it cost $8.00, but it was exactly what he was looking for, and he was thrilled. What we did not know is that my nieces had invited a bunch of their friends for Christmas Eve, as had my sister and brother-in-law. Since The Tim had been building everyone up for a "Big Surprise on Christmas Eve" since we'd arrived, he had no choice but to go through with it. Soooo many people looked puzzled and/or scared. 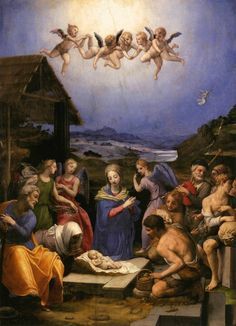 Several knew exactly what he was going for, and it ended up being one of the best Christmas Eves ever. My nieces still remember every year when "Uncle Tim dressed like Cousin Eddie," and last year, my great-nephew (then 8 years old), Zach said he thought it was unfair that we can't make it home for Christmas Eve anymore, because now he would "never see Uncle Tim dressed up like a guy." *That's* funny in and of itself, if you ask me! So this year on Christmas Eve, I hope you have a fun time with your family, and maybe even watch a movie or two. If nothing else, remember the year that "Uncle Tim dressed up like a guy," and have a chuckle. Does your family do anything ridiculous at holiday time? I'd love to hear about it! TWO WEEKS TO GO UNTIL CHRISTMAS DAY! I used to regularly wish my life away. I was always thinking about the next thing, how things would be better/cuter/nicer next week, month, etc. You get it. A couple of years ago, it occurred to me that this was a stupid way to live - and over this last year, I have especially tried to work at being mindful. If you recall, my word for the year was "grace," which also included being mindful. I've been doing pretty well. I still look forward to things, but that is definitely different than wishing one's life away. But I must admit that the past couple of days, I've been wishing for tomorrow, big time. Since it is such a problem for me, I have to fast for 2 days. TWO DAYS. To say it makes me miserable would be kind. But I am hoping very strongly that this will be the last time I have to do this for years. I had a successful one last April, but instead of being able to wait for years like most people, my dr wanted me to have another one in 6 months. Ugh. And granted, it's now 8 months, since I kept forgetting to call for an appointment, but still, not having to do any of this again soon would be really wonderful. The one thing that is successfully distracting me from my nausea and headache (a result of not eating) is Christmastime. 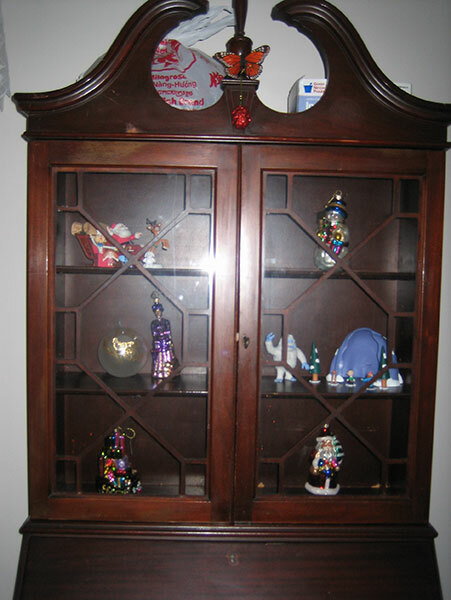 Over the weekend, I finished most of what I needed to get for family gifts, and The Tim brought up the boxes of decorations from the basement. I am going to work on them as soon as I finish this post, and then hope to get finished after I get home tomorrow. The Tim wants to get the tree in the next couple of days, so all that will be left will be decorating the tree and starting to bake! YAY!!!! In TWENTY DAYS it will Christmas Day. But Christmastime is here, and that's even better. I have found that, even if at first I have to do it consciously, being happy about this makes it possible to enjoy it no matter what else is happening in the world, or how many grumpy, holiday-hating types you encounter. And it is the best gift you can give to yourself, and anyone else around you. If you have read my blog for any length of time, I'm sure you have seen this picture before. 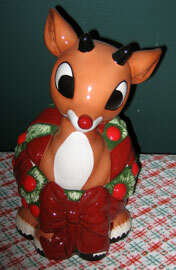 It is a cookie jar based on the character of Rudolph the Red-Nosed Reindeer as portrayed in the Rankin-Bass 1964 TV program. To say I LOVE that TV show would be an understatement! Anyway, at one point, the Lenox company manufactured several products related to that show as Christmas decorations, and The Tim gave this one to me for our anniversary. 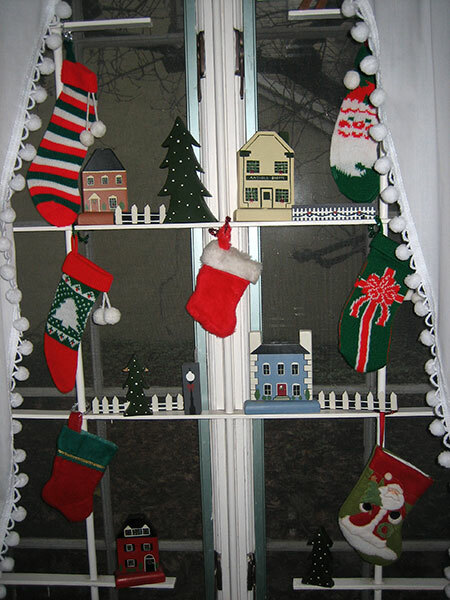 Since then, it has always been one of my very favorite Christmas decorations, and held pride of place on the dining room table. Every time I would see it, I'd smile, and it was always one of the very first things unpacked, since it was easily identifiable in its own box. 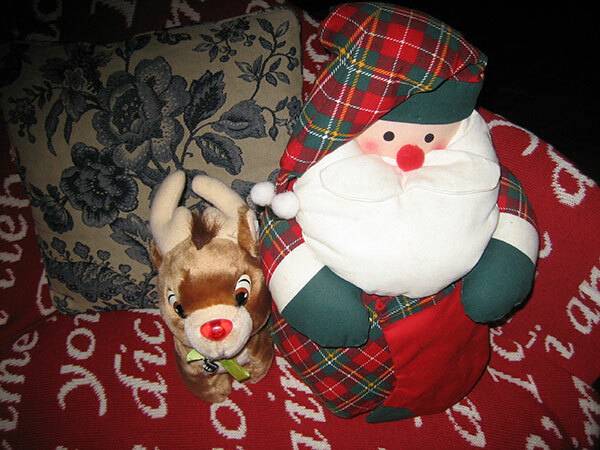 Rudolph survived so much - moving, being stored in the basement much of the year, various visits from children, and investigations from cats, just to name a few. Then the Koodle joined the family. Things were OK the first year, since he was busy with other decorations and ornaments. Surprisingly, he didn't break anything, he was just a normal, curious kitten. But last year, he decided that dashing across the dining room table was a faster way to get to any other cat he was chasing. Apparently, he tried to stop quickly one day (The Tim was home when this happened, and this is his version of the story), and the tablecloth moved, and Rudolph fell onto the wood floor. And that was that. I know that in the grand scheme of things, this is not a tragedy. But it still broke - and breaks - my heart. The Tim always says that I get way too attached to things, and I probably do, but I'm not likely to suddenly change at this point in my life and not care any more. And this decoration was more than a "thing" to me. So earlier in the week, when he brought up the boxes of Christmas stuff from the basement, I kept looking for Rudolph's box, and then remembered what had happened. Because I was curious, I looked online to see if any were around. Apparently over the years, it has become a "collectible," so I could replace it yes, but only if I have $75.00 - $150.00 to cough up for it. I just hope anyone who does spend that money on one really really loves it. 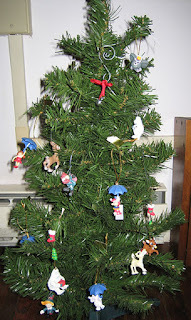 And I hope that this year, there will not be a repeat of the Koodle Christmas Story. The good news is that Christmastime is well underway, so it's much easier to be happy than sad! Happy December 1st - 24 Days Until Christmas!!!! Before we move on to that fun, Carole's Ten on Tuesday prompt this week was to list 10 Best Things I Did in November. I can do that. 1. Got some cleaning and organizing done, in general but also in order to feel a little more prepared before holiday crazy set in. 2. Served as a sounding board for a co-worker whose mother was dying. I know it's weird to say this is a "best" thing, but I truly felt glad that he felt comfortable enough to talk to me about it, and since it was sadly similar to my experience with one of my parents, I was happy to help him however I could. 4. Celebrated The Tim's birthday. 7. Sorted things to see what we do/do not have for Christmas gifts. 8. Went to see a play. It was one of The Tim's birthday gifts. It was "Baskerville" by Ken Ludwig, and it was ridiculous and fun. 10. Completed NaBloPoMo. And enjoyed it all immensely. It was a good month, and a wonderful start to the holiday season. Happy all around.